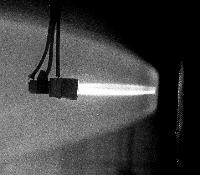 The following photographs were made in the Physics 180E undergraduate laboratory course in plasma physics by Professor Reiner L. Stenzel. They are designed to demonstrate the single particle motion in electric and magnetic fields. A weak electron beam of typically 100 eV, 1-10 mA is injected from an oxide-coated cathode into a low pressure (0.2 mTorr) argon gas. The beam partially ionizes the gas. The background plasma has a potential close to that of the grounded chamber wall. The beam electrons are accelerated by an electric field mainly concentrated in the cathode sheath. The trajectory of the beam electrons is visible due to light excitation when the beam electrons collide with argon atoms. 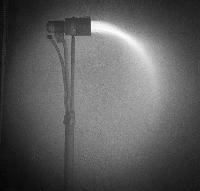 No visible light is produced when the electron energy is below typically 10 eV. Several basic phenomena can be inferred from the following pictures. 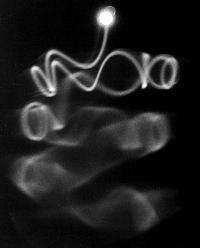 These were taken with a Rolleiflex camera, 400 ASA, black and white film, with up to one minute exposure time. Fig. 1. 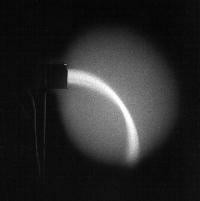 A 100 eV electron beam is injected into a neutral gas without applying external electric or magnetic fields. The beam light starts very close to the cathode indicating that the electrons acquire their full energy in a very thin cathode sheath. 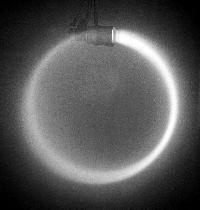 Thus, the self-produced plasma acts as an anode. The initial beam convergence indicates concave equipotential surfaces near the cathode, presumably due to a radial density gradient. 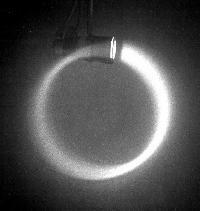 The beam scatters by collisions and beam-plasma instabilities. (Larger image: 114,808 bytes, 913×461 pixels). Fig. 2. The beam is injected against a negatively biased grid. When the bias voltage is slightly larger than the cathode voltage most of the beam is reflected but a few electrons are transmitted. Note that the equipotential surface near the grid is not plane but convex. This causes an angular spread of the reflected electrons. Electrons in the center of the beam are normal to the sheath and can pass the grid when their energy exceeds the potential energy of the sheath. (Larger image: 111,597 bytes, 927×475 pixels). Fig. 3. Beam injection against a very negatively biased grid which reflects all electrons. Note dark sheath near grid where the electron energy is decreased below 10 eV. The electrons stagnate in the dark sheath and form a convex equipotential surface. This causes the reflected beam to be highly divergent. (Larger image: 249,846 bytes, 836×732 pixels). (Larger image: 229,104 bytes, 767×809 pixels). Fig. 5. A low energy beam is injected across a magnetic field as in Fig. 1. The cyclotron radius is decreased. Note the dark gap between the cathode and beam onset. In this sheath region the electrons still have insufficient energy for light excitation. (Larger image: 124,601 bytes, 575×609 pixels). Fig. 6. A low energy beam is injected against a decelerating electric field. As the beam energy falls below 10 eV the light emission stops. The beam and current continue to flow through the dark region. (Larger image: 95,390 bytes, 663×669 pixels). Fig. 7. At high neutral pressures the injected electron beam rapidly spreads. The electron mean free path can be inferred from the beam decay. (Larger image: 206,348 bytes, 799×767 pixels). Fig. 8. 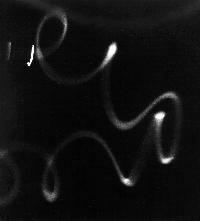 Electron motion in crossed electric and magnetic fields. The trajectory is a cycloid, i.e., a superposition of a circular motion and a constant drift to the right. The cyclotron orbit implies a magnetic field direction into the plane and the E×B drift implies that the electric field points downward. From the known beam energy the field strengths can be obtained from cyclotron radius and guiding center drift. (Larger image: 147,526 bytes, 863×601 pixels). Fig. 9. Mirror reflection of a weak electron beam in a nonuniform magnetic field. The beam is injected oblique to the field lines which converge to the right. Due to the adiabatic invariants (energy and magnetic moment) the parallel energy is converted into perpendicular energy at which point the particles reflect. Alternatively, the parallel motion is decelerated by the repelling force of an increasing magnetic field. (Larger image: 173,651 bytes, 850×941 pixels). Fig. 10. 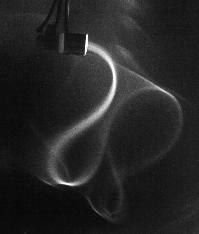 Mirror reflection of a stronger electron beam in a magnetic field which converges to the right. Note that the guiding center (axis of spiral) of the reflected beam does not coincide with that of the incident. This is due to the gradient and curvature drift in a nonuniform field. (Larger image: 215,620 bytes, 1015×761 pixels). Fig 11. Multiple reflections of an oblique electron beam in a mirror magnetic field. The cyclotron motion is the fastest periodic motion, followed by the slower bounce motion between the mirror points. Gradient and curvature drifts cause a third, slowest rotation azimuthally around the mirror axis. This is the classical charged particle motion in the ionosphere in Earth's magnetic dipole field. Collisions and other scattering processes diffuse the beam. (Larger image: 188,031 bytes, 817×1015 pixels). Fig.12. Electron beam injected into a nonuniform magnetic field with a null line. The beam meanders along a magnetic null line pointing diagonally down to the right. Note the reversal of the cyclotron rotation as the magnetic field reverses to either side of the neutral line. Such meandering and figure-eight trajectories have been studied theoretically in the problem of magnetic reconnection occuring in the magnetosphere and on the sun. (Larger image: 190,012 bytes, 761×893 pixels). Return to Physics 180E page. Return to Dr. Stenzel's page. Last Revision: 25 January 2000.